Second Assist’s name is based on the surgical hierarchy in the operating room: the surgeon operates, the first assistant helps and operates, and the second assistant is there to provide whatever help possible when and where the surgeon and first assist need it most. 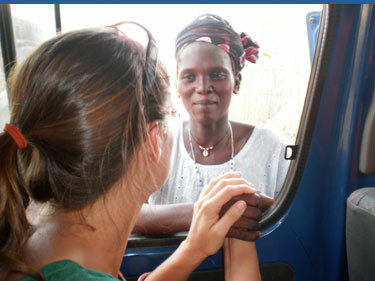 Eleven years ago, Dr. Juillard, Second's Assists co-founder, went to Senegal for the first time as a Peace Corps Volunteer. When she arrived in the village of Samba Diarry, where should would spend the next three years, the people of her village wondered what this alien was doing in their midst. She could barely communicate in Pulaar, let alone get water from a well, farm her own food, or be of any use to the people around her. She was completely dependent upon her host family for her every survival need. The first six months in Samba Diarry were relentlessly humbling, but with time the community of once-strangers became like a second family. It was this experience working and living in a rural community in West Africa that provided the foundation for Dr. Juillard's career in medicine and the desire to make quality health care accessible to those who need it. Surgery has long been viewed as a luxury for people living in locations where hospitals are either too far away, too expensive, or too ill-equipped to treat them. The traditional public health paradigm supports programs and funding for specific disease processes rather than health systems improvement. The provision of surgical services is different in that it allows patients with many diseases processes to receive treatment. A woman in obstructed labor, a young child with a broken femur, a mother with breast cancer, these are surgical treated diseases but there has been little work done in the public health field to improve access to surgical care for these and millions of other patients in the developing world. As a surgeon-in-training Dr. Juillard found some like-minded colleagues who are also concerned about the lack of access to surgical care in the developing world. Together and with the support of generous donors who support their vision, they have created Second Assist, a non-profit organization whose mission is to improve access to safe and quality surgical care in the developing world. Second Assist’s operating philosophy evolved specifically from the most important lesson that Dr. Juillard and other founding members learned while working in the developing country setting: Never make assumptions. Any successes Second Assist achieves will be the product of patience, waiting to understand certain cultural nuances before acting, collecting information about local practices, and learning about local priorities. All of Second Assist's activities are underscored by this principle. Right now, there are very few surgeons doing public health research in developing countries. Most surgeons who work internationally do so by going there for short periods of time, operating, and then leaving. While that approach provides critical short-term care, it does not address the deep need to train and support the local doctors and public health practitioners to better help the patients in their communities. Second Assist is committed to doing this work.